Το άρθρο περιγράφει σύντομα την τρέχουσα κοινωνικοπολιτική κατάσταση, έχοντας στο επίκεντρο την ανεπάρκεια των παραδοσιακών μεθοδολογιών κοινωνικοπολιτικής κινητοποίησης να αλλάξουν την πορεία των κοινωνιών μας. Επίσης, παρουσιάζει διάφορες κατευθύνσεις που μπορούμε να εξερευνήσουμε προκειμένου να ξεδιπλώσουμε μια νέα μεθοδολογία, μια μεθοδολογία καλύτερα προσαρμοσμένη στις σημερινές κοινωνικοπολιτικές συνθήκες. A few decades after the fall of ‘actually existing socialism’, we are experiencing the fall of ‘actually existing liberalism’, so to speak. How should the left approach this historical moment? In Europe, democracy – understood as the access of people without economic power to crucial decisions regarding the course oftheir societies – is successfully limited today. The institutional design and the prevailing political mentality shape the ground for the elites to openly exclude popular needs from decision making. A few decades after the fall of ‘actually existing socialism,’ we are experiencing the fall of ‘actually existing liberalism,’ so to speak. From a historical perspective, the two falls are simultaneous and mark the beginning of a hard clash between the elites and the people. The neoliberal project signifies an open, ambitious and brutal strategy to radically change the basic coordinates of human societies and modes of subjectivity. The elites – under the pressure of the ongoing capitalist crisis – have launched an offensive for the eradication of the emancipatory dynamic of modern societies: multi-dimensional exclusion of people in terms of access to crucial decisions and satisfaction of vital needs, deterioration of civility, multi-dimensional processes of enclosure (resources, spaces, knowledge, information) etc. Similarly, the traditional way of doing politics is not working anymore. Supporting and organizing movements – i.e. expressing/pushing demands to the state – and participating in elections in order to change the balance of forces within the state cannot deliver the change that the majority of the people need today. The premise that made the traditional methodology of doing politics so well-established was that the elites – persons and other legal entities with economic power – are committed to accept the democratic ‘game,’ i.e. to include people’s demands in shaping the strategic coordinates of societies. Instead of an inclusive approach that characterized both centre-right and centre-left parties in the past, today there is a growing trend towards multi-dimensional social exclusion and a democratic ritual unresponsive to people’s needs. Especially in Greece, the institutionalization of the neoliberal order, i.e. 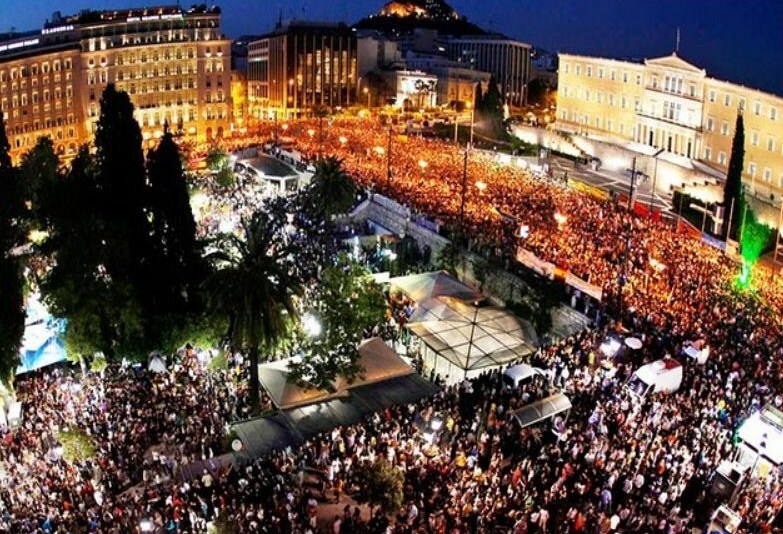 the successful excision of key funding and liquidity functions from the state, the respective concentration of power into anti-democratic institutions and the subsequent control over vital functions of Greek society, have created a perplexing and hazardous socio-political conjuncture. The political system has crossed a critical threshold, entering a mode of functioning which could be described as the ‘Squeeze Effect’: the national political spectrum has been squeezed and forced to function within the nearly non-existent space of freedom that the ‘agreement’ allows. The political spectrum has been pushed in a tiny space, seemingly irrelevant to the crucial economic and social issues, struggling to fit its different poles into a space so tiny that these poles eventually overlap and poke through each other. The ‘Squeeze Effect’ has highly deforming implications that further erode the function of political representation. We could say that before the establishment of a neoliberal consensus in the 90s there was a quasi-democratic political functioning, subject to military coups, whenever a radical readjustment of balance of forces was needed. Then, the right-wing and social-democratic parties adopted neoliberalism as their political program, decisively downgrading their function as agents of political representation. And now we are in the phase of institutionalized neoliberalism in which a new circle of political deformation has been launched; a circle that reflects the advanced degree of institutionalization of the anti-democratic neoliberal mode of governmentality in Europe. Because of the ‘Squeeze Effect,’ the political system has become explicitly incoherent, amplifying confusion and feelings of despair within Greek society. Moreover, the ‘Squeeze Effect’ further alienates the political personnel from the real-life conditions of the population, making it entirely impenetrable to the people’s impasses and anxieties. The negative social consequences and psychological implications caused by austerity and social decline can no longer be reflected at the political level. They cannot be represented, democratically expressed, and hopefully positively transformed in such a way that contributes to social stability and cohesion. Without a minimally proper function of political representation in place, these social and psychological wounds – in the form of negative and (self-) destructive dispositions – are spread across all social networks of interpersonal relations, disturbing social cohesion in a deeper way. The basic coordinates of the political system are changing profoundly. The politicians and the political parties are no longer accountable to the people through the mechanisms of representative democracy. Rather, they are accountable to market mechanisms and respective institutions in order to draw the necessary funds for the continuation of vital economic and social functions. In this context, the criteria for political success are significantly modified: being a successful politician no longer means that you are responsive to people’s demands and needs, but rather it amounts to being able to increase the competitiveness of the economy according to the profit analysis and investment assessment of capital owners. In other words, the biggest service that a politician can provide to his/her society is the optimal compliance with the objectives of financial entities that can ensure the smooth running of the society. We are thus witnessing a different codification of power relations in terms of accountability: the accountability towards citizens through democratic means is replaced by the accountability towards the capital-owners through market mechanisms. There is an additional reason that forces us to drastically change the way we organize and act. Apart from the fact that we are living in a period in which the neoliberal transformation threatens democracy, establishing a social/institutional configuration that blends the logic of profit and competition with authoritarian modes of governance, we have also entered an era in which long-term tendencies approach a critical point threatening humanity with severe regression: depletion of natural resources, environmental instability, food crisis, deep erosion of social cohesion and collapse of national and regional systems of administration and performance of basic social functions. Moreover, we are facing major authoritarian threats due to new waves of technological advances and the accumulation of massive digital data (‘surveillance capitalism’). At the same time, we have never been so close to an evolutionary/emancipatory step. Literally every day, human activity – both intellectual and practical – is producing experiences, know-how, criteria, methods and innovations that inherently contradict the parasitic logic of profit and competition. For the first time in our evolutionary history humans have a common fate and so many embodied capacities and values from different cultures within our reach. The current institutional design, the narrow-minded strategies of the elites and the prevailing neoliberal mentality are fundamentally unable to provide the proper conceptual and operational framework that we need in order to deal with these challenges. Real solutions must be based on sustainability, solidarity and openness in order to counter the long-term tendencies of reaching a crucial bio-social limit, the rise of inequality and barbarism (that gradually takes the form of an extermination process of the poor), and the threat of digital/military/financial authoritarianism. The neoliberal framework is toxic towards these preconditions. That’s why it is vital to explore ways of conceptualizing and administering complex societies based on values like democratic and decentralized decision making and running of basic social functions which are going to replace neoliberalism in terms of governmentality. This is a broader responsibility that can unify people with different political and ideological origins. How are we going to modify and enrich our methodology of political and social mobilization and organization in order to respond to these profound challenges? How are we going to cope with growing social exclusion and reassert people’s participation in crucial decision-making? What kind of methodology of politics will allow us to be more efficient, without presupposing the democratic rules we used to take for granted? What kind of methodology of politics will allow us to restore democracy by newly transforming it? First of all, we must shift priorities from increasing political representation to building popular power. Instead of being mainly the political representative of the popular classes in a European framework designed to be intolerant to people’s needs, we must set up an autonomous Network of production of Economic and Social Power (NESP) – an ecosystem of resilient, dynamic, and interrelated circuits of co-operative productive units, alternative financial tools, and local cells of self-governance with community control over infrastructure facilities, digital data, energy systems, distribution networks, etc. These are ways of gaining a degree of autonomy necessary to defy the elites’ despotic control over society. In other words, in order to meet the requirements of today’s antagonisms, we need to obtain a degree of autonomy in terms of performing basic social functions under people’s control. And in order to create the popular power needed for the required degree of autonomy, we must shift the balance between representing people’s demands and facilitating and organizing people’s activities in our methodology. Furthermore, the role of an innovative political organization of the twenty first century should be to contribute to the alignment and mobilization of the creative social forces in order to elaborate sustainable and resilient survival strategies towards the serious challenges we have to face. Facing these challenges, we must be able to realize our structural weaknesses in terms of political imagination, methodology of mobilization and organizational principles. We must overcome patterns like the gradual disconnection of left government officials from their party and the popular classes when in power. We must work systematically on problematic features like this, based on the everyday outcomes, ideas, innovations and achievements of the powerful collective intelligence which is accessible today. A lot of people nowadays move towards new ways of doing things; they build new kinds of institutions and form hybrid types of organizing and acting. Most of these people have different life trajectories from those affiliated with the traditional political left and they followed their own paths that lead them in this global fight. If we expand our horizon and include them, then we will realize that we may be much stronger than we think. A series of social, political and geopolitical antagonisms are unfolding as we speak. History moves on fast. Is the left going to be part of this historic movement that we trace everywhere around us? History doesn’t owe us the leading role just because we tend to think of ourselves as the bearers of change and progress. We have to earn the right to be relevant, present and able to influence the course of our societies by transcending outdated methodologies and organizational inertia. I strongly believe that if the traditional left modifies its operating system, then it can be an essential component in this historic moment. Together with other forces, it can significantly contribute to the evolutionary step which is of vital importance today. This article draws on a round-table discussion that took place at the Workshop ‘Europe’s new radical Left in times of crisis,’ hosted by the School of Political Sciences at the Aristotle University of Thessaloniki and supported by the Rosa Luxemburg Stiftung (Athens Office) in November 26-27, 2016.